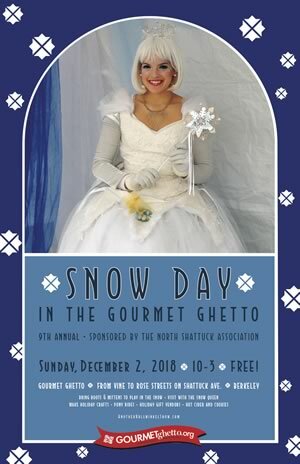 Take a Snow Day in the Gourmet Ghetto! Take a snow day in the Gourmet Ghetto! Bring your boots and mittens to play in the snow that is predicted to gently fall on Shattuck Avenue between Rose and Vine Streets in Berkeley on Sunday, December 2, 10AM-3PM. One has a real diamond ring inside! – donated by M. Lowe & Co. as a benefit for the Berkeley Schools. Warm up with free hot apple cider and snacks provided by Safeway. Enjoy the California Revels Solstice Ensemble singers, the Bay Area Youth Harp Ensemble, and Chris Abbe, a balloon twister, who make the day fun! This is a free event for children of all ages sponsored by the North Shattuck Association in conjunction with M. Lowe & Co., Safeway, State Farm Insurance, ToyCycle, Buy Local Berkeley, Spokes, 510Families, East Bay Express, Berkeley Community Media, East Bay Loop and Yelp.